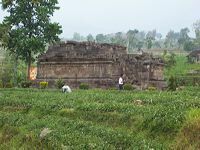 Kesiman Temple is located in Kesiman Tengah village, Pacet district, Mojokerto regency. 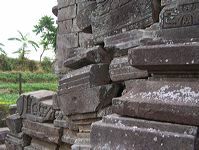 Kesiman Temple is only left its foot part and body part. This temple is looks out upon west direction. 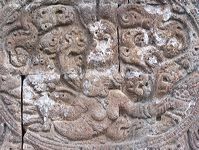 On its fourth body part, has crafted some relief in Javanese style, medallion, rectangle, and human. In medallion, there is animal relief; then in rectangle, there is entertainer. The up stair is located in southwest and southeast side. The under part of stair in southeast is getting broken. The north side wall of the entertainer is dragon relief that pull by two human, in left and right side. 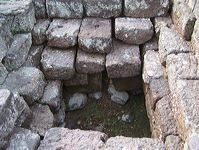 While, in right and left side of the up stair is “Gana”.